The Guild of Fine Foods created in 1995, instituted the Great Taste awards, which you may have seen in the form of a large round black sticker on various food products. The Great Taste Awards, a kind of ‘oscars’ of the food world, takes place in London and Gillingham, Dorset. Last week I went down to Gillingham to do some judging myself. Each year, 450 experts take part with morning and afternoon sessions of around 2 to 3 hours. 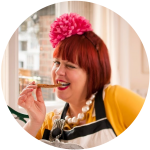 Each session consists of 6 tables with 3 or 4 judges (chosen from the food world and comprising deli owners, chefs, food writers, producers, cheesemongers and some keen amateurs who have applied) plus 2 ‘referral’ tables with 2 judges each. Over a morning session you try around 24 products, plus up to a dozen others which require a second opinion from other tables. The foods range from cheese to jars of preserves, chutneys, ready meals, ice creams, biscuits, cereals, breads, meats, chocolates, marshmallows, smoked salmon, cakes, cooked eggs and milk. Some tables like to alternate savoury with sweet, others prefer to start with savouries then end with sweet foods. All of the tables leave any chilli products until the end, in order not to perturb their taste buds. In between tastes, you sip water or nibble on some crisp apple slices. To one side is a kitchen where a troop of chefs cook the food according to instructions, to see whether they are accurate. Judges regularly receive foil-covered platters with a joint of sizzling beef or a leg of pork complete with searing hot crackling. Hot foods take priority. As a non-meat eater, I wouldn’t taste any meat products, leaving that up to my fellow judges. However I had expertise in other areas – vegan foods, and special ingredients of which I have particular knowledge such as mastiha, a resin from the Greek pistachio tree on the island of Chios. I spoke to one of the head judges, a horticulturalist called Tim who does all 49 days of the judging. I mentioned that I liked chilli. “You are very welcome then as many of our British judges are sensitive to chilli,” he replied. At one end of the room is a high table, literally taller than all the other tables, on which sit two judges, like tennis umpires. Products that get zero or one star are referred to the ‘referral’ table where it is double-checked. Extreme care is taken to make sure that every product gets a fair go. As the day goes on, it is delightful to be with other foodies, concentrating and analysing flavour and taste. “This has bitterness on the nose, and an undercurrent of sour with a trailing back note of sweet” is an example of the sort of chat. It’s quite a tiring process, really intense. The tasting is ‘blind’: we are discouraged from peeking beneath coverings to see labels, the embossed names of chocolate brands are scratched off and food is served in plain covers. Judges are asked to imagine that the producer (of the product you are tasting) is sitting at the table with you and we are expected to spend at least 4 to 6 minutes on each product. 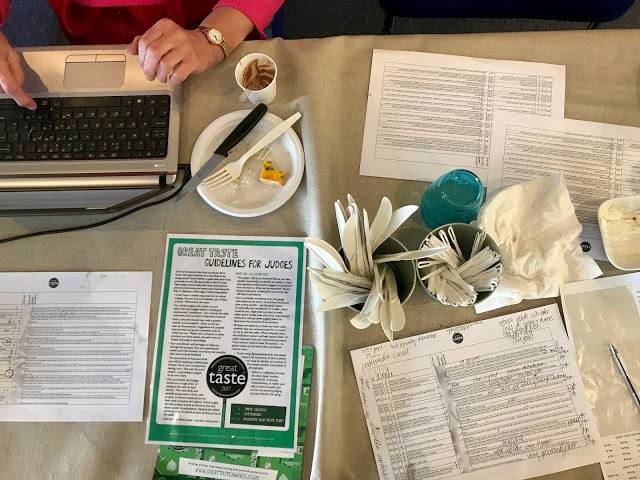 A judge at each table writes tasting notes on a computer. Start off with the positive. Describe the appearance. Even if it tastes bad, it might look pleasant. Describe the smell. Describe the texture: is it crunchy? Is it sticky? How does it feel in the mouth? How long does the taste last? The words ‘uneven distribution’ take on significance. Woe betide the chocolate chip cookie that has all the chocolate chips clustered in one part of the cookie. We sniff, we nibble, we poke, we spread. We ask the kitchen for things to help us judge. I asked for a small glass of milk in which to scoop the dry muesli. You can ask for salt. Every table has a wheel of flavours from flowery to fruity to woody and so on, very similar to the book ‘The Flavour Thesaurus’. We are encouraged to be constructive with criticism. Even if the product does not get any stars, we make suggestions: ‘improve the quality of the nuts’ or ‘add a little salt’ or ‘this rose-scented spice mix does not actually taste of rose’ or ‘where are the poppy seeds’ about a biscuit that is described as possessing this ingredient. You can suggest more acidity, fat, sugar, spice. Descriptions of products are often pretentious: everything is hand-done: ‘hand stirred’ ‘hand cooked’ ‘hand flavoured’; all butter, meat, cream and milk is ‘grass-fed’ or ‘pedigree’; quite pedestrian items are readily described as ‘unique’, ‘authentic’, ‘expertly infused’. “Usually the more high-flown the description, the more disappointing the product,” sniffed one judge. Every so often a jolly gentleman with an occasionally disapproving glare (when I was 15 minutes late one morning or when I asked if I could tweet) called Nick comes out to the middle of the floor and congratulates us judges on finding a new 3 star product. We all applaud when this happens. We feel ownership, to some extent, of the products’ success. Over one afternoon there was a record-breaking 6 three star products. Last year 130 products were acclaimed as three star. Only a few become part of the World’s Top 50 food and drink products. Despite our expertise, it’s generally very clear what is good and what is bad. Sometimes it’s hard to describe, but that is the nature of this job. Why is this pistachio ice cream superb, a three starrer, and this other one, also nice, but somehow without star quality. The differences are minuscule but at the same time astoundingly obvious. On the way to Dorset, I dropped off my copper pans to be retinned at Sherwood Tinning (more about this in an upcoming blog post), then drove to the Grosvenor Arms in Shaftesbury village where I would be staying. Wandering around I noticed an enormous loaf of bread in a metal and fibreglass effigy outside the church. 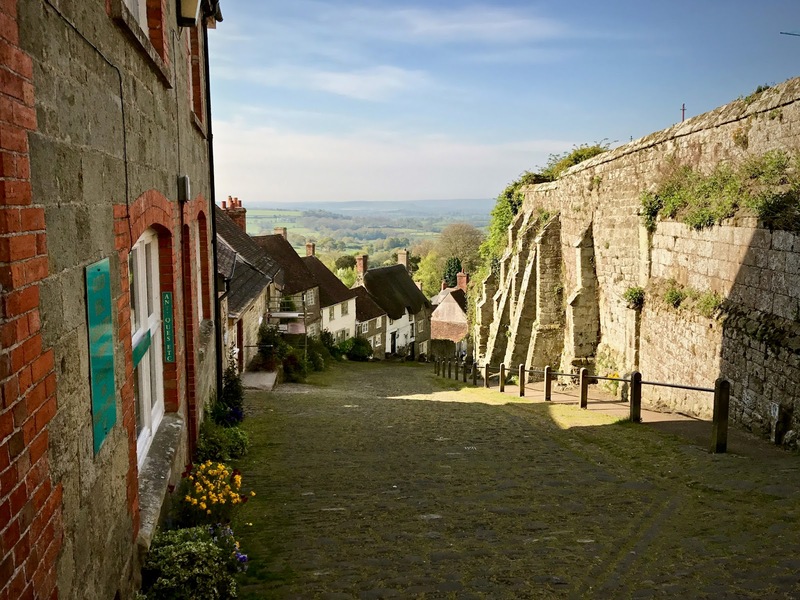 Only later did I discover that this was in front of a famous cobbled hill, Gold Hill, also known as ‘Hovis Hill’ where ‘Britain’s most popular television ad’ was filmed in 1973 by a young director Ridley Scott. I’d always assumed the ad took place in Yorkshire because the voice over had a broad accent. It was a sepia tinged film of a cloth capped boy pushing his bike up a steep hill, delivering Hovis. "This has bitterness on the nose, and an undercurrent of sour with a trailing back note of sweet"
Did the sniffy comment about product descriptions also apply to the quality of the judges? TBH this sounds like my idea of hell. Meeting the producers and trying their products = good. Overly pretentious and verbose pontification= bad. I was impressed with the knowledge and tasting abilities of the judges actually.